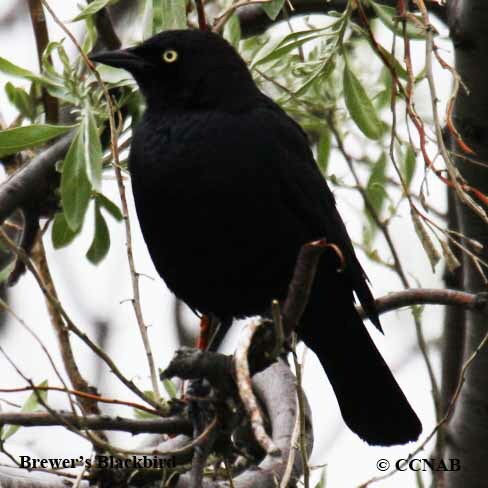 Species: The Brewer's Blackbird (Euphagus cyannophalus) is one of the most common blackbirds seen in North America. Being able to use a more varied habitat than some, it does require marshes but makes its existence in fields, riparian woodlands and even in towns and cities, in the winter months. 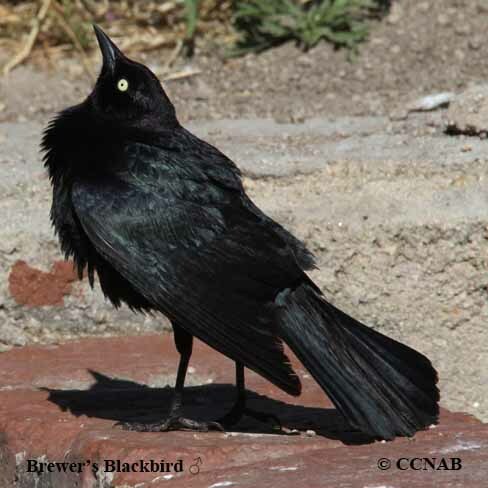 Distinctions: The male has yellow eyes and an all-black shiny plumage. It is seen this way all year around, giving off an iridescent blue to purplish sheen. 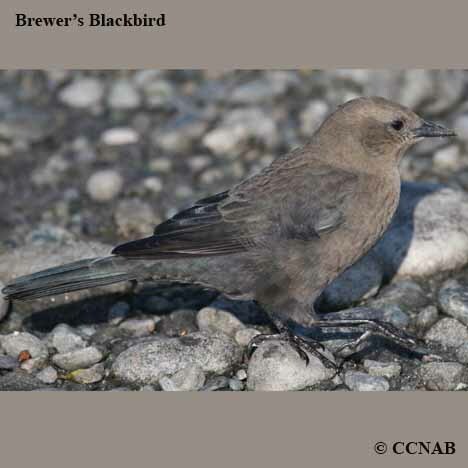 The female has dark coloured eyes and a greyish black plumage. The juvenile is very similar to the female. 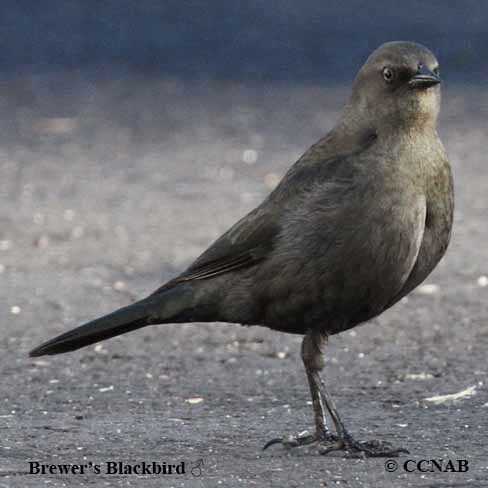 It can be a challenge to distinguish the Brewer's Blackbird from the Rusty Blackbird as both bird types are similar in size, both have an all-black plumage, but one of the male Rusty Blackbird's features, when seen in breeding plumage, shows more of a green iridescent sheen. 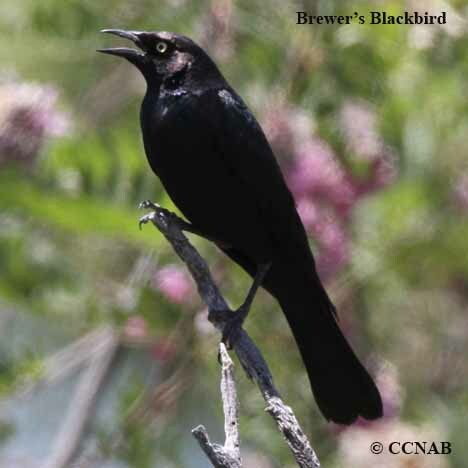 Voice: Single call notes, some similarity to other types of blackbirds. Nesting: Four to five light grey to light greenish, with smudges of brown spots. Nests are built low to the ground in shrubs and trees or on the ground itself and are composed of grasses and plant materials. 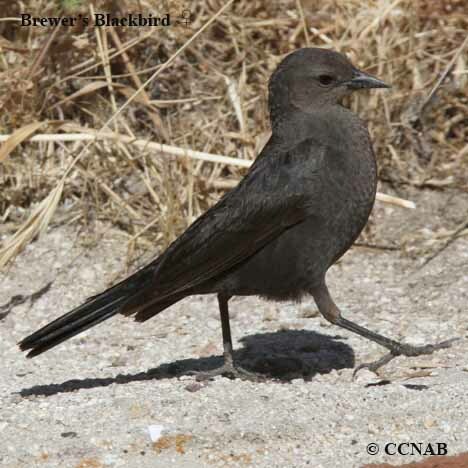 Distribution: Found in a more diverse environment than most blackbirds, ranges from fields, riparian landscape and even city parks. This blackbird is accustomed to people. Seen from east of the Great Lakes to northern British Columbia, south to southern California and east to northern Florida.